distinguished herself particularly through her legendary „mouldings“, focussing and exploring the architectural space and the body through sculpture. It is a transformative and poetic work, that deals primarily with private spaces and belongings, architectural fragments from mostly the 19th century, feminism, domestication and the individual or collective experiences and memory. Heidi Bucher’s artistic legacy, is concurrently a visionary and aesthetic testimonial, as well as a conceptional liberation from an old, patriarchal affected world. Her work is included in numerous exclusive museums and private collections worldwide. 2019 The Site of Memory, Gallery Lehmann Maupin, New York, April 25 – June 15, 2019. 2016 Hommage à Heidi Bucher und Carl Bucher, Kulturort Galerie Weiertal, Winterthur, CH. 2017 The problem with having a body is that it always needs to be somewhere, The approach. Curated by Nora Heidorn, London, UK. 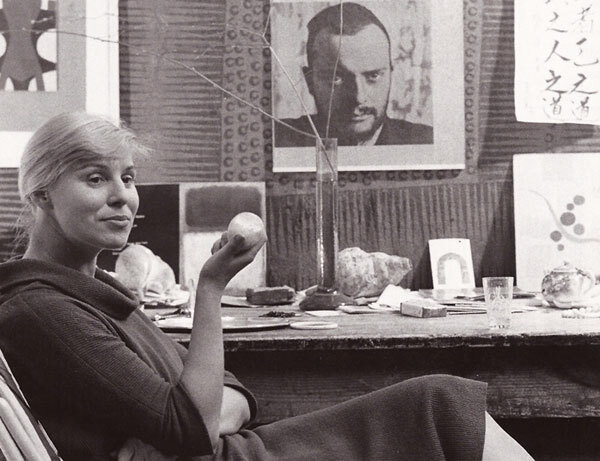 In 1956 she exhibited her work for the first time, at the Galerie Suzanne Feigel in Basel. She showed silk collages. Between c. 1954 and 1960 she was a close friend of the scholar, librarian and Dada expert, Hans Bolliger. In 1956 she went to New York, and made the acquaintance of the gallery owner J.B. Neumann through Bolliger. She subsequently managed his legendary World House Gallery on Madison Avenue, designed by the architect Friedrich Kiesler (the endless house). In 1958 she exhibited her silk collages and drawings there. She developed friendly contacts with such people as photographer Hans Namuth and the Cobra artist, Karel Appel. After returning to Zurich in 1960, she met and married the artist Carl Bucher. Indigo Bucher was born in 1961, Mayo in 1963. In joint opposition to their own family and social background, the couple pursued their shared vision of an ‘artists’ family, with all the risks and consequences that entailed. Their flat on Central in Zurich, which was also their studio, quickly became an open house. Many interesting personalities of that period – such as the artist Max Bill, Bruno Bischofberger (Carl Bucher’s gallery dealer at that time), the critics Erika and Fritz Billeter and Willy Rotzler – were frequent guests. Carl Bucher had considerable success on the art scene at the time with his ‘Landings‘. In 1969 Carl Bucher received a scholarship from the Canadian government, and the whole family moved first to Montreal, and then to Toronto for a year. Quite large exhibitions with public appeal by Carl Bucher and performances by Heidi Bucher led the family to California (Hollywood Hills and Santa Barbara), before they finally returned to Switzerland via Canada in 1973. Among the works produced in California were ‘Bodyshells‘ and ‘Wrappings‘ by Heidi Bucher, which were shown as exhibitions in Los Angeles County Museum of Art and at the Esther Bear Gallery in Santa Barbara. With ‘Landings to Wear’ Heidi and Carl Bucher undertook their first concrete attempt at declared collaboration. It was Heidi Bucher’s idea to produce Carl Bucher’s ‘Landings’ as wearable sculptures. In Los Angeles the couple met the PopArt artist Ed Kienholz, and both formed a lifelong friendship with him. Inspired by the Pacific Ocean, Heidi Bucher for the first time used pure mother-of-pearl pigment for the large-surface monochrome painting (using the spray technique) of her soft sculptures, some of which were wearable. Mother -of-pearl was a revelation to her. Since her childhood she had always been fascinated by the iridescence and shimmering of the tiniest shells and insects or the brilliance of a fish’s scales. In the early 1970’s the family returned to Switzerland. From then on Heidi and Carl Bucher went their separate ways – their ideas of the husband and wife and collaboration were too different. Heidi retained the surname Bucher, but kept herself at a distance in order to pursue her own work as an artist. She rented an old butcher’s shop and a flat on Weinbergstrasse in Zurich, near Central. The spacious basement with five separate rooms, which almost without exception were lined with white, yellow or red tiles, served as her studio. Heidi Bucher painted many of th the tiles white, light blue or dark blue, which gave the rooms and individual atmosphere. In the centre of the studio was the cold store which she called ‘Borg’. It was one of her earliest skinnings, which she exhibited for the first time in 1977 with other works described as ‘Einbalsamierungen’ (Embalmings) in the Galerie Maeght in Zurich, run by Elisabeth Kübler. Many exhibitions and projects at a wide variety of venues followed. In 1990 Heidi Bucher fell ill with an incurable tumor. She died three years later in the aptly named town of Brunnen (fountain).